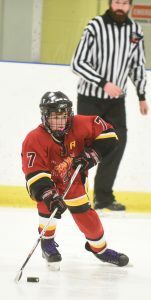 Fisher Ward of host Aylmer Minor Hockey’s Peewee entry rushed the puck toward the South Muskoka net during a game in AMHA’s annual season-ending Rep team tournament at East Elgin Community Complex, Saturday, March 24. Aylmer won that game 6-0 and with another win and a tie, met Ingersoll in the final Sunday afternoon. Aylmer fell just short of the championship in a close 3-2 contest.